A disk space monitor that works..
How much free space is left? Welcome to CorzSpaZio (pronounced: Cor-zSpaT'chio), a program that lets you know, at-a-glance, exactly how much free space is left on your hard disks, and other storage media. In case you wondered, "Spazio" is Italian for "Space". Clever, huh? 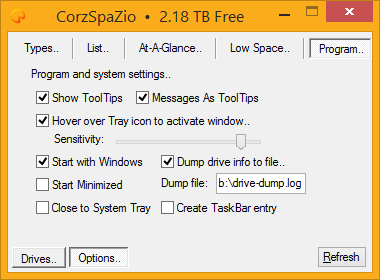 CorzSpaZio is unashamedly based on Disk Space Pro, but better. Disk Space Pro, by Peter Pearson (who's site is sadly long gone, though DSP downloads are still scattered around the net) is, or rather was, my favourite disk space monitoring utility. Now, of course, that accolade belongs to CorzSpaZio. I always seem to be running out of hard disk space, and find myself having to keep an eye on exactly how much of it is left, and where. Hard disks still aren't cheap enough, and so I use this tool a lot. And any tool I use a lot, has to be right..
CorzSpaZio displays important information about all Windows fixed disks, removable, optical and network disks, as well as RAM Disks, even unknown disks. Everything is configurable. Just like Disk Space Pro, it doesn't continuously prod your disks for details, but always has them on-demand, when you need them. You can leave CorzSpaZio running at all times, toggling it from its tray icon, enabling you to better manage the resources on your various disks; especially when juggling disk space, awaiting a new batch of blank DVD's, or maybe considering yet another new hard disk. CorzSpaZio's operation is very simple. The main GUI/window is a list of the various storage media on your system, how big they are, and how much space is left on them. When you launch it, or click "Refresh" (F5), CorzSpaZio quickly scans (or rather, queries) your system's storage devices, and displays its findings in a regular "details" type list..
How is it better than Disk Space Pro? Don't get me wrong; I like Disk Space Pro. A few years back, I literally spent an entire day looking for disk space monitors that would do the job, and do it the way I wanted; simple, unobstrusive, and resource-friendly. I tested dozens of different utilities. Disk Space Pro was the very best of the bunch, in my opinion, and for a couple years I used it every day, though still occasionally searching for something that *really* worked the way I wanted. It's a great wee tool, and was a must-have Startup Item. 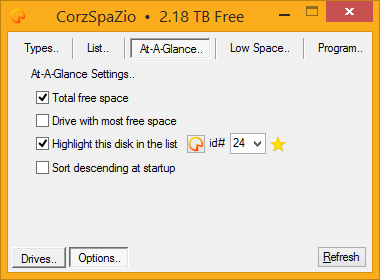 CorzSpaZio shares many features with Disk Space Pro; disks appear in a list view, with columns you can click to sort the data (and click again if you want to see the data temporarily reverse-sorted). You can choose to show and hide a variety of different disk types; fixed, removable, optical, and so on, and the totals are clearly displayed, especially the total free space, in both numeric and percentile form. But the CorzSpaZio GUI goes much further; allows you to resize those colums permanently, as well as re-order the columns by simple drag and drop, and have all that customization remembered for next time. These extras are things I always wanted in DSP, though perhaps not enough, on their own, to warrant a ground-up rewrite of one of my favourite programs. However, Disk Space Pro has some annoying quirks. Without any reason it would, sometimes many times a day, disappear from my desktop and system tray altogether, and yet, as process explorer revealed, runs in the background, window-less and eating resources (admmittedly, not a lot); needing force-quit and restarted, which was annoying. To be fair, it hasn't had an update since 2001, so it's highly likely Windows evolving is a factor. The GUI is bulky, too, with all that empty space in it. These things more than any other, made me want to get under the hood with a coding spanner. Also, I wanted some extra features for my own disk space monitor. For instance, I want to be able to double-click on a disk, and open that disk. CorzSpaZio does that - and clicking on the Total: row, opens My Computer, or whatever you call it on your system (It opens in your normal folder view mode, by the way, SHIFT-Click to force open in folder pane mode). You can also right-click on a disk and do the same thing from a menu, as well as empty that disk's Recycle Bin. The same menu on "My Computer" (or whatever you call it) enables you to empty all the volume's trashes, which is basically the same as emptying the trash from your desktop's trash icon, if you have such a thing. I also thought it might be cool to have my disk space monitor email me when things got critical, so CorzSpaZio does that, too**. Also, I always felt that F5 should do a refresh in Disk Space Pro, and right up until I stopped using it, would do it instinctively, in error; so CorzSpaZio does that, too, amongst other wee tricks; like.. Title Bar and System Tray disk space information. 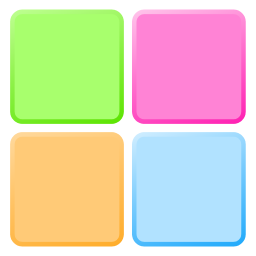 Fully customizable list colouring, including alternate colors. At-a-glance notification of your biggest cache of space. Automatic low-space checking, with optional alerts. Low-space volumes can get special warning icons. Customizable alert threshold, in GB, MB or % (percentile) form. Optional number rounding for ultra-small displays. Customizable warning icons (load icons from .exe, .dll or .icl files). Multiple options for skipping certain disks/types. Direct access to your disks from within the interface. Empty trashes from the disk's context menu. Customizable drive list font face, size and weight. Drag & drop audio alert (WAV) import. System Tray GUI-Activation, with full sensitivity control. All the controls have handy mouse-over ToolTips. Column order, size and sort are remembered. Also, I wanted some experience working with columned list views. So there. You can get to all of your CorzSpaZio preferences from the GUI's options tab. Either Ctrl-Tab (move to next tab) or click the "Options" button to get there. Inside there are four simple preference sections. Here you can choose which kinds of disks to display info for; Fixed Disks, Network Disks, RAM Disks, Optical Disks (Blu-Ray, DVD, CDROM, etc), and Removable Disks (like flash disks, thumb drives, and floppies), and even Unknown Disks, if any should pop up. Although floppy disks are technically "removable" disks, it's really only the disk itself that's removable, and so you can also choose whether or not to display information for floppy disks, the latter preventing annoying floppy drive access when there are no floppy disks present. You can also choose whether or not to display information for empty drives (e.g. DVD drives with no disks in them will appear as empty). Check or unckeck what you need. Here you can set how you want your list view to look. Choose whether or not to use "TB" and "GB" values (otherwise, everything is in Megabyte values), totals, gridlines, and disk icons, as well as custom icons, if your disk has any (see tips for more details). I added number rounding, too, so "25.34 GB" can be displayed as "24 GB", if you prefer. This is also where you can set the foreground and background colors - click the color boxes to choose a color using the system color picker. The alternate row coloring can be set manually, too, or else you can let CorzSpaZio calculate the color automatically, based on your slider setting (the higher the level, the darker the alternative color). Note: Using the color slider overrides the alternate color box's manual setting, and vice-versa. Also Note: If you set any custom colors in the color picker, they will be remembered for next time. Dontcha just hate it when programs forget! The At-A-Glance settings control the information you get when you look at CorzSpaZio or its tray icon, and how prominently that information is presented. 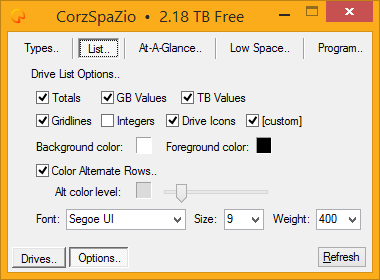 You can choose to have the total space, as well as the disk with the largest cache of free space displayed in CorzSpaZio's Title Bar and System Tray icon ToolTip. You can also give that disk a special icon in the list, so you can find it at-a-glance. 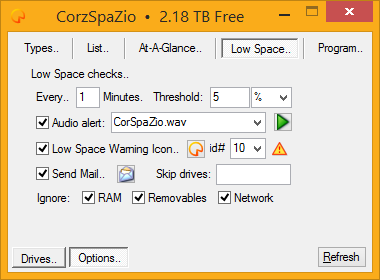 This is where you tell CorzSpaZio exactly what you mean by "Low Space", how often to check for that, as well as exactly what to do if this situation ever occurs on any of your disks; displaying a special icon in the list (you can select your own icon for this) and/or giving an audio alert of some kind. CorzSpaZio can even mail you about it. Click the mail icon to set your mail sending (smtp) preferences (see the image, below) - highly useful, both at home or away. For audio alerts you can specify a frequency value, in Hz, from 37 to 19999, which will emit a beep of that frequency from your PC speaker, if you have one. Alternatively, you may specify the path to a WAV file to use as your audio alert. You can keep a folder of wavs just for CorzSpaZio, which will be automatically added to your audio alert drop-down. Simply create a folder called "wavs", put it next to CorzSpaZio.ini, and put some wav files in it. A few samples (no pun intended!) are included in the distribution. Drag and drop WAV files directly onto the audio alert input, to have them automatically imported to your wavs folder, tested and loaded, ready-for-use. You can also test any audio alert yourself, by clicking the green play (triangle) icon. 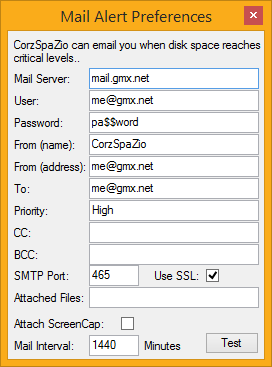 Note: Audio alerts only occur during manual operations, not auto-checks, and alert mailing occurs only during auto-checks, not manual operations, and at most once an hour (by default - you can set this, though note; CorzSpaZio won't auto-mail more than once every thirty minutes about a particular disk, nomatter what you set). CorzSpaZio uses a plain text ini file to store your preferences, though as all the settings are built-in to the options tabs, it's unlikely you will need to look at that. The disk type icons can be hacked (though there's really no need with custom icons - see tips for more details), but that's about it. Instead, I went to town with the preference tabs. Enjoy! ** Okay, technically, this is possible. For example, if CorzSpaZio sent a mail about disk G: at 10.30am, and at 10.45am, disk E: becomes critical, CorzSpaZio will mail you about it right away (so long as it hasn't already mailed you about this disk within the last hour), and in that mail, of course, all your critical disks will be listed. As well as the mail function mentioned previously, CorzSpaZio has a special command-line switch you can use, which is simply mail, e.g.. This launches CorzSpaZio, instructing it to immediately check the available disks, and if any are critically low on space, send an alert email, and then promptly quit. This is designed for scripting and scheduling. Note, if your regular preference is to not send mail - this switch will temporarily override that setting, and won't interfere with your normal usage. The Program settings control how CorzSpaZio behaves in your system and on your desktop. There are handy ToolTips for all CorzSpaZio's controls, so you can see how to use them. You can also choose to have CorzSpaZio's messages displayed as ToolTips (which appear in the top-left of the main window). This is also where you control CorzSpaZio's cool mouse hover activate functionality. Basically, if CorzSpaZio is burried behind lots of windows, you can hover your mouse pointer over CorzSpaZio's System Tray icon, and CorzSpaZio will jump to the front. Simple, but effective. You can control the hover sensitivity, that is; how responsive CorzSpaZio is to your mouse hovering over its System Tray icon. Set that all the way to the left (1) and you will have to move the mouse over the icon for a good second to get CorzSpaZio to appear. Set it all the way to the right (10) and CorzSpaZio will jump to the front almost instantaneously. You can choose to have CorzSpaZio startup when you login to your desktop, and also start in a minimized state, if preferred. CorzSpaZio can also have a TaskBar entry. Though less elegant, it means CorzSpaZio will resopond to Win+M (minimize all windows) and will be visible in the TaskBar when the window is active (not minimized). CorzSpaZio can also minimize to the tray and not quit when you click the close button ("x" in the top-right hand corner of the main window). A few people asked for this. Finally, this tab is also where you can set the location of your drives dump file, if you use that. Use a simple file name to have the dump file created (and updated) in the same directory as your CorzSpaZio.ini. Use a full path if you want it somewhere else. 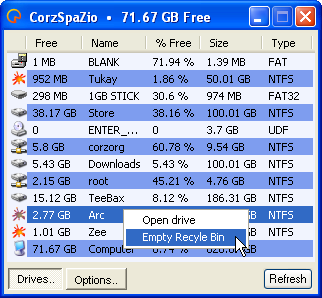 Like most of my Windows tools, CorzSpaZio features Auto-Portability™, and can run in a completely portable state; handy for thumb drives, secure stations, DVD-R media, or wherever else you might need a portable disk space monitor and want to keep the settings locally, next to the program itself. In fact, to activate portable mode, that's all you do - place your CorzSpaZio.ini right next to CorzSpaZio.exe. On modern Windows systems, Vista/Windows 7/etc., its ini file lives here..
On older systems, it will be here..
Move or copy the file next to wherever you put CorzSpaZio.exe. That's it. If CorzSpaZio finds CorzSpaZio.ini next to itself during launch, it switches to portable mode and looks no further. If you can't be bothered looking for the ini file, or don't have any old settings you need to keep, CorzSpaZio has a special portable activation switch you can use, which is portable, e.g.. This switch simply instructs CorzSpaZio to install a fresh CorzSpaZio.ini right next to itself. You only need to do this one time (though it would do no harm to repeat); from then on CorzSpaZio is in portable mode. As well as being useful for read-only media, diskless workstations and such, you can also use this portable functionality to run multiple copies inside the same desktop, even simultaneously, and each with completely unique settings. You could have one for displaying network volumes, another for optical drives! Tip: Like DSP and regular Explorer windows, you can double-click just to the left of a column header's divider to automatically resize the column to fit its content. Handy. Tip: Like many applications, you can use Ctrl+Tab to move between the program's tabs. Ctrl+SHIFT+Tab does the same, but in reverse. Switching to the main tab automatically refreshes it with any changes you may have made. Tip: Click the tray icon to toggle CorzSpaZio's window. When it appears, it will automatically refresh its information, and re-sort the columns for you. Tip: Hover your mouse over CorzSpaZio's tray icon for on-the-spot free space information (how much, and on what disk), useful when CorzSpaZio's window is minimized. Tip: If you don't want to see a certain data column, slide its width all the way to zero! Tip: To rename the column, Shift-click the column's title. If you want a blank column header, use a space character. It's no problem to have them all blank, if that's your bag. Tip: Right-click the column headers for extra options. Same goes for the Audio alert combo (drop-down). Tip: When you restore CorzSpaZio's window from the system tray, the disk list is automatically refreshed, so you don't have to. You can see it happen. Although it would be easy enough to have this happen quickly in the background, and then display the window, I prefer to watch it happen, so I know it did. Tip: If you double-click an empty space in the list, it opens "My Documents" (or whatever you call it), and is the equivalent of "No Location", which I find poetic. Tip: If you don't want to keep a folder of wavs just for CorzSpaZio, you can enter the full path to any wav file, and CorzSpaZio will use that, instead. And don't forget you can always use Hz values for simple PC beeps (37-1999Hz). Tip: If required, you can make your list window extremely small. When you switch to the options, CorzSpaZio will thoughtfully resize itself to fit the options tabs, and when you're done, resize back to the way you had it. Way more fun than I intended. Tip: Enable Custom Icons in the list options, and CorzSpaZio will scan the disk's desktop.ini or autorun.inf for a custom icon entry, and if it finds one, and it's valid, CorzSpaZio will use it. Download and use CorzSpaZio, for free.. Note: You will need a unicode capable Windows® system to run CorzSpaZio, that is; Windows 2000, 2K3, XP, Vista, Windows 7, 8, 10, 2012 and later Windows operating systems. CorzSpaZio will not run on Windows 9x or ME. aka. 'version info', aka. 'changes'.. This is usually bang-up-to-date, and will keep you informed if you are messing around with the latest beta, and let you know what's coming up next. Note: it was getting a bit long to include here in the main page, so now there's a link to the original document, instead..
You can to the latest version.nfo in a pop-up windoid, here, or via a regular link at the top of this page. with as much detail as you can muster. This is great software! I've been looking to replace my disk space monitor with something more simple for ages. This popped into google! It's simple and comprehensive at the same time. Love it! The email worked first time too! Hi, its a great program, love it. Thanks! Please consider a license! There is actually a physical limit to how much data can be shown in the tray. For "all" data, see CorzSpaZio! It' s cramped right now. Hah! I misread that! Configurable HotKEy for minimize. Will do. That' s malware' s behavior. Come on! you are better than that. It only happens once! On first launch. And again after a month of use. After you take a look at what I'm offering, it doesn't bug you again. Are you saying you use my software without even checking out what I was offering? Oh man! CorzSpaZio already has an option to exclude a list of drives from low disk space warnings. It would be helpful if it were possible to exclude a list of drives from disk space sums too. The reason why that feature is necessary is because of virtual disks. For example, a drive with a Truecrypt volume on it would be counted twice in disk space and percentage calculations because first the bare drive would be counted, and second the mounted Truecrypt volume would be counted, when in actuality, their disk space is equivalent (shared). Currently, you could simply set the bare drives to not show in the list ("Types" pane of preferences) and they would not be counted in the totals or percentages. The TrueCrypt volumes would be counted as usual. In situations where the virtual drives take up only a portion of the bare drive, it becomes slightly trickier. As it stands, if the TrueCrypt drive is file-based, and both the bare drive and TrueCrypt drives are showing in the list, CorzSpaZio would consider all the space used on the bare drive and the unusued space unused on the TrueCrypt volume, so the space works out fine, although the total does show extra capacity, amounting to the size of the TrueCrypt drive. If you tell me how else, exactly, you would like it to work, I'll definitely look into it. I didn't consider the situation where only some of the bare drive is used by a TrueCrypt file. In that case, there would need to be 2 options: #1 a checkbox to ignore capacity, and #2 a checkbox to ignore free space (and percent free). Then, I can see free space but not capacity, or vice versa. Or, I can check both boxes to ignore a drive completely. Of course, you could use a comma-separated list of drives for each option, like you already do. Hmm, maybe it ought to be a radio button with 3 options instead of checkboxes: #1 ignore capacity, #2 ignore free space, #3 ignore completely. That would require those options to be available for each drive in the UI. You could put it in the right-click context menu. I think that is quite comprehensive! With so many options, it would seem to make sense to have this in the context menus of the main list (perhaps also in the prefs, settable via either). The trouble (aside from all the extra UI) is that there are two separate types of ignoring going on. One, for drives in the list and another for free space checking (visual/email notifications). And one setting will affect the other. Thanks for the suggestions. I will have a think about it.